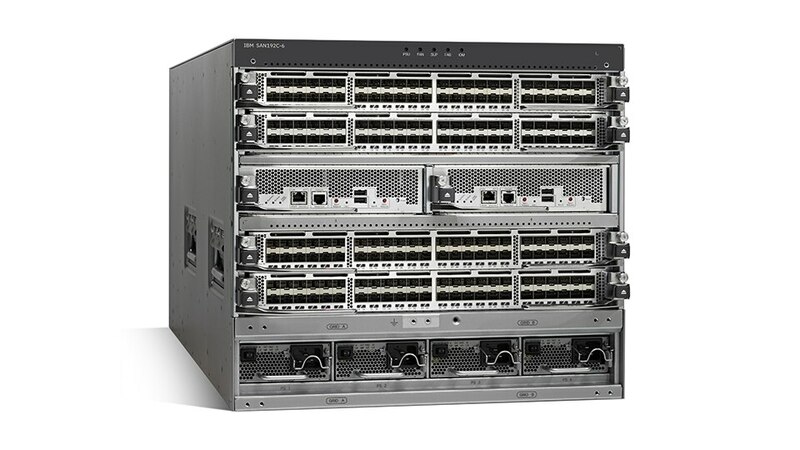 IBM Storage Networking SAN192C-6 is a director-class SAN switch designed for deployment in small to mid-sized storage networks that can support enterprise clouds and business transformation. It layers a comprehensive set of intelligent features onto a high-performance, protocol-independent switch fabric. SAN192C-6 addresses the stringent requirements of large virtualized data center storage environments. It delivers uncompromising availability, security, scalability, and transparent integration of new technologies for flexible data center SAN solutions. Enables meeting scalability needs in the cloud. Enables deploying multitenant cloud applications. Helps meet stringent service level agreements (SLAs). Enables an always-on cloud infrastructure. Allows rapid and cost-efficient allocation of network capabilities to cloud applications. Supports IBM z Systems FICON and Linux environments.